An almost unheard of neighbourhood on the northside of Brisbane boasts a tantalising Japanese ramen noodle lover experience. A small restaurant situated in Geebungs' heart expresses itself modestly with wooden tables packed neatly into a space adorned with wall high Japanese memorabilia.This even includes for sale oil-paintings. Bustling around lunchtime, the friendly owner happily takes requests to tailor your meal to your level of 'spiciness.' Having been here over half-a-dozen times, I highly recommend the generous sized portions of the miso soups and chicken ramen noodles. For an affordable and efficient dining experience locally, this is a must see! 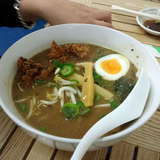 For more information on Men-Jikan Japanese Noodle Restaurant, check out their Facebook profile here. Why? A tantalising Japanese ramen noodle lover experience.